Help employers bond with your candidacy by creating a resume that emphasizes results. Get ideas from this sample resume for a midlevel chemist. Your resume can be the catalyst for an effective job search, says resume expert Kim Isaacs. Help employers bond with your resume by creating a well-organized document that emphasizes results. 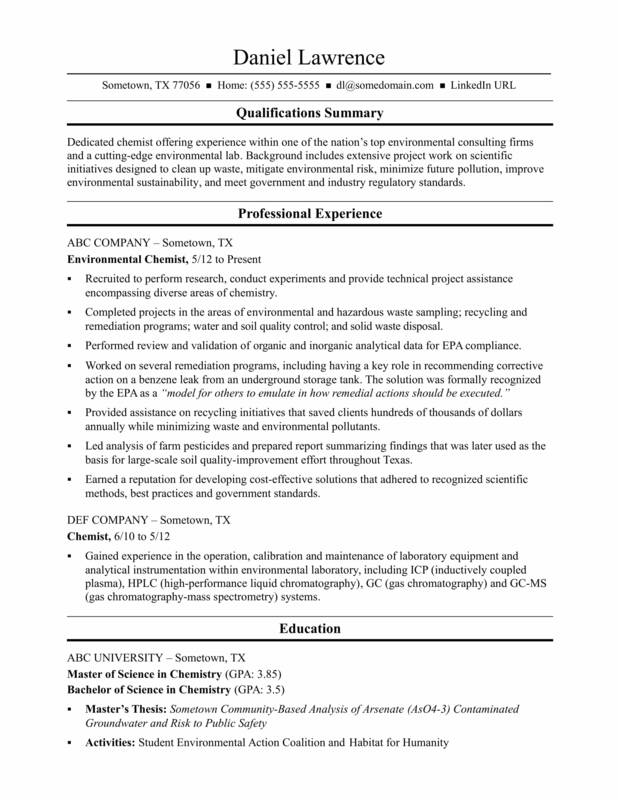 Get ideas by viewing this resume sample for a midlevel chemist that Isaacs created below, or download the midlevel chemist resume template in Word. And if you need more help, let the experts at Monster's Resume Writing Service create a high-impact resume for you that will impress employers. Additionally, you can search for chemist jobs on Monster. Dedicated chemist combining excellent academic credentials with four years of experience within one of the nation's top environmental consulting firms and a cutting-edge environmental lab. Background includes extensive project work on scientific initiatives designed to clean up waste, mitigate environmental risk, minimize future pollution, improve environmental sustainability, and meet government and industry regulatory standards. Recruited to perform research, conduct experiments and provide technical project assistance encompassing diverse areas of chemistry for projects. Completed projects in the areas of environmental and hazardous waste sampling; recycling and remediation programs; water and soil quality control; and solid waste disposal. Performed review and validation of organic and inorganic analytical data for EPA compliance. Provided assistance on recycling initiatives that saved clients hundreds of thousands of dollars annually while minimizing waste and environmental pollutants. Led analysis of farm pesticides and prepared report summarizing findings that was later used as the basis for large-scale soil quality-improvement effort throughout Texas. Earned a reputation for developing cost-effective solutions that adhered to recognized scientific methods, best practices and government standards. Gained experience in the operation, calibration and maintenance of laboratory equipment and analytical instrumentation within environmental laboratory, including ICP (inductively coupled plasma), HPLC (high-performance liquid chromatography), GC (gas chromatography) and GC-MS (gas chromatography-mass spectrometry) systems.